MISS OCEAN CITY 2016 - Shannon Wallace and her court, third runner-up Julia Erickson, second runner-up McKayla Perry and first runner-up BriarRose Ginn. Shannon Wallace was crowned Miss Ocean City 2016 by outgoing queen Kendall Coughlin on Saturday the 8th of August 2015 at the Music Pier. Wallace beat out 11 other hopefuls for the top prize at the scholarship pageant, which is celebrating its 46th year. This year’s pageant was themed “Ocean City: Not Just a Vacation, a Tradition” and was sponsored by the Ocean City Exchange Club. 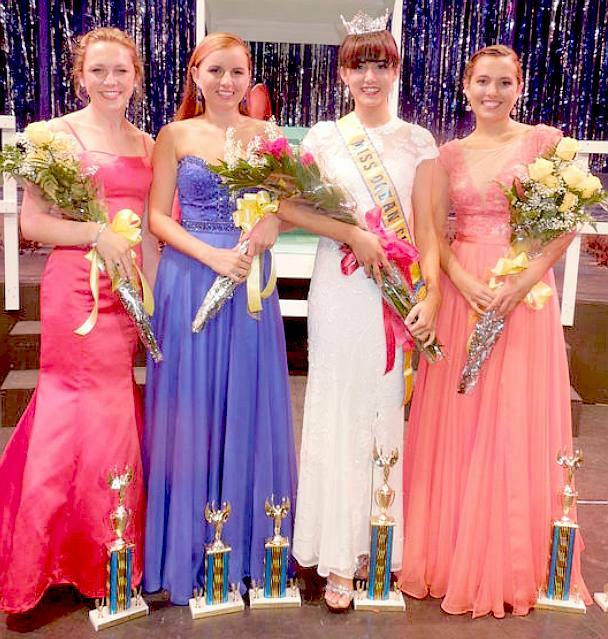 First runner-up was Briar Rose Ginn; second runner-up was McKayla Perry; and third runner-up was Julia Erickson. Miss Wallace was the top choice among 12 contestants after competition in talent, swimsuit, poise and interview. The contestants were between the ages of 16 and 22, and each was an Ocean City High School student or graduate or the child of an Ocean City property owner. In addition to the crown, Wallace, who graduated Ocean City High School in the spring, took home awards for interview and talent. Ginn won the poise award and Perry won the swimsuit and parade awards. Other award winners were Emily Batastini for People’s Choice, Samantha Horowitz for Hostess Award, and Amanda Meachon for Miss Congeniality. In addition to the winners, contestants included Sadie Ford, Isabella Rose O’Brien, MacKenzie Pearce, Alexa Rosen and Abby Waid. Former queens Devon Vanderslice and Carley Del Sordo served as hosts and the pageant was produced by Kaitlyn Schoeffel and chaired by Warren Iredell. Over $12,000 in scholarships and prizes were given away. Crowds roar from inside the Ocean City Music Pier as Kendall Coughlin was crowned Miss Ocean City on Saturday night. Kendall also competed in Miss Ocean City last year and was third runner up to the crown, but short year later Kendall took the crown for her own and was overwhelmed with excitement. 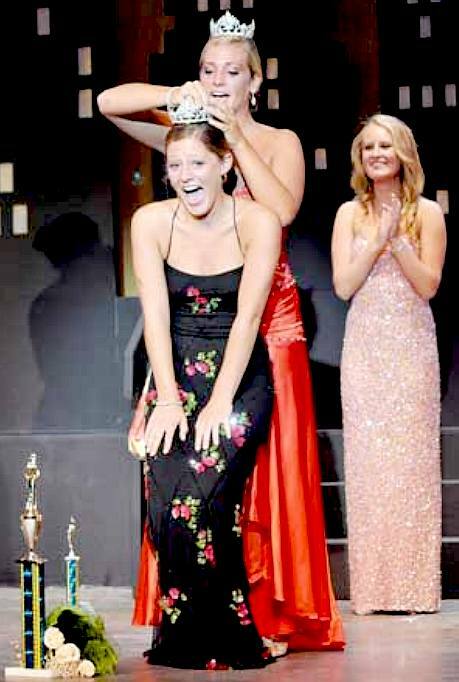 She was crowned by Miss Ocean City 2014, Carley DelSordo, who was extremely excited to pass on the crown to her fellow contestant and friend. The newly crowned Miss OC greeted her huge fan section after finally making her way down the runway and waved at the crowd through many tears and gasps of happiness. This title was not so easily won; all of Kendall’s fellow contestants proved to be a tough group to beat. Each contestant possessed amazing talent, poise, and intellect that surely all of them were fit for the job. Along with winning the title, there were many other awards and scholarships to be won. From the Talent award to Miss Congeniality, the awards were big and plentiful thanks to the efforts of the Exchange Club of Ocean City who sponsored the event. MISS OCEAN CITY - The contest always produces a number of superb swimsuits. Keeping our oceans healthy for bathing is all part of ensuring that blue growth is sustainable for a circular economy. Ocean City High School student Dana Piccoli will have some extra memories from her senior year. She will spend the year representing her city as Miss Ocean City 2010. Piccoli won the title, and accompanying crown, on Saturday, Aug. 15 at the Ocean City Music Pier. Judging by the expression of shock on her face, she wasn’t expecting the crown. “No, not at all,” she said as friends, fellow contestants and her mother gathered around her to congratulate her on stage. The pageant, presented by the Exchange Club of Ocean City, presented 16 talented young women competing for the title. The production, “Thoroughly Modern Molly,” included talent, evening gown and swimsuit competitions, as well as performances by outgoing Miss Ocean City Molly Lavin, Junior Miss Ocean City Sarah Ford and Little Miss Ocean City Carley Boehning. In the end, it was Piccoli, 17, who was the choice to represent the city at its many events. She was crowned by Lavin, who she credits with convincing her to compete. “Molly (Lavin) actually talked me into it. We have been really good friends for a while. 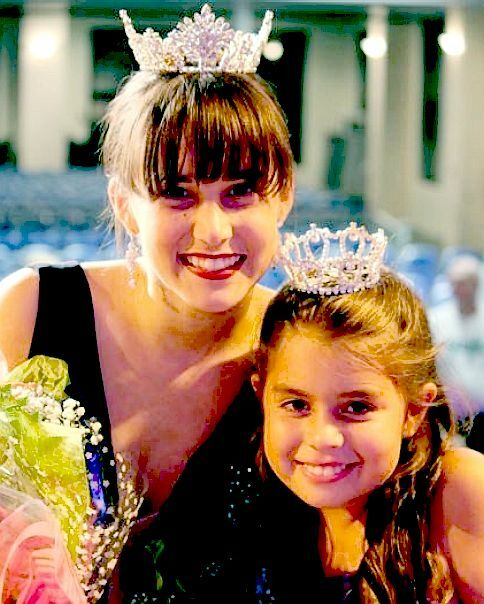 Her mom has always told me that I should do pageants,” Piccoli said shortly after being crowned. The pair has competed on the varsity Ocean City High School girls crew team. Lavin rows; Piccoli is a coxswain. She is also an OCHS cheerleader. After the pageant, Piccoli, who was sponsored in the pageant by Uncle Bill’s Pancake House, admitted the pageant brought out a little of her competitive spirit. It obviously worked for her. As Miss Ocean City, Piccoli receives: a $1,000 scholarship, presented by the Gillian family; a $3,000 scholarship and a $1,200 wardrobe allowance, both from the Exchange Club; her crown, sponsored by the City of Ocean City; and crown box, donated by Katie Ulmer and Robin Williams-Vitale, Miss Ocean City 2000 and 1997 respectively; and a trophy, donated by Ocean City Home Bank. Piccoli also won the Parade Award, a $200 gift certificate to Heritage Surf & Sport, and a trophy donated by Jo-El McLaughlin. She is the daughter of Rick and Barbara Piccoli, who admitted to be pleasantly shocked at their daughter’s new title. “It is incredible. It is just amazing. We’re all in shock. She did one pageant 10 years ago, I think. That’s about it,” mom Barbara said after Dana’s crowning. First runner up was Shelby Clark, 17. Clark, a former Little Miss Ocean City, sponsored by Island Beach Gear. With her first runner up finish, she receives: a $1,500 scholarship from the Exchange Club, a $500 scholarship donated by Ocean City Home Bank, and a trophy, donated by Molly Lavin. Jennifer Gonsior, 21, was second runner up. She was sponsored by Hello Dollies. As second runner up, Gonsior receives a $1,400 Bud Laufer Memorial Scholarship, presented by the Exchange Club, and a trophy donated by Mandy Decker, Miss Ocean City 1995. Gonsior also won preliminaries in Interview (a $500 scholarship presented by Nazha Cancer Center and a trophy donated by Michael D. Bloom DDS) and Swimsuit ($250 scholarship donated by the FMBA, and a trophy donated by Donna Gay Dillon Boutique). Third runner up was Meghan Berry, 17. She receives a $1,200 scholarship presented by the Exchange Club and a trophy, donated by Jamie Ginn, Miss Ocean City 1999. 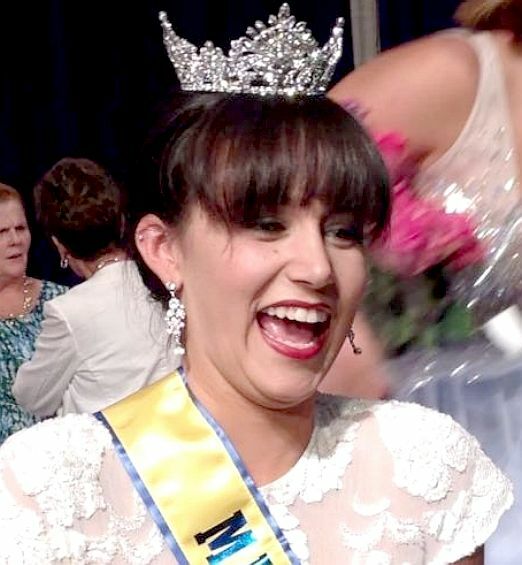 Myra McCann, 17, rounded out the top five as fourth runner up. She was sponsored by McCann & Sons Realtors. She receives a $1,000 scholarship from the Exchange Club and a trophy donated by Beth and Ron Beaver. The talent preliminary was awarded to Holly Wentz, 18, who performed an exciting contemporary dance routine. She received a $500 scholarship, presented by the Godfrey family, and a trophy donated by Steve and Dawn Eberhardt. She was sponsored by Wallace Hardware. The Miss Congeniality Award, and its accompanying $250 scholarship presented by the Ocean City PBA, was awarded to Mindy Austin, 20. Her trophy was donated by Daniel Greene, Miss Ocean City 2007. She was sponsored by Boyar’s Food Market. The Eileen Parks Hostess Award was won by Caroline Eisenhauer, 17. Eisenhauer, sponsored by Mama Mia’s Restaurant, received a $500 scholarship and a trophy, both presented by the Exchangettes. The People’s Choice Award was Sami Rumer, 16, who was sponsored by Gillian’s Island Water Park. She received a $100 scholarship presented by Bethy and Andi Cocozza, Miss Ocean City 2004 and 2008, respectively, and a trophy donated by Ginny Mulford, Miss Ocean City 1971. All flowers for the pageant were donated by Spinning Wheel Florist. Becky Young, 19, who was sponsored by Fred’s Auto Service. The Miss Ocean City Pageant is sponsored each year by the Ocean City Exchange Club. Pageant program chairperson was Katie Ulmer. Executive director was Ed Price. Aubre Naughton, who also performed during the pageant, was pageant executive producer. Kara Hill was contestant chairperson. The pageant was emceed by Michael Kelly. Judges were Miss New Jersey 2006 Georgine DiMaria, Miss Ocean City 1995 Amanda Decker, Chris Saltalamacchio, Kate Stier and Chris Talvacchio. 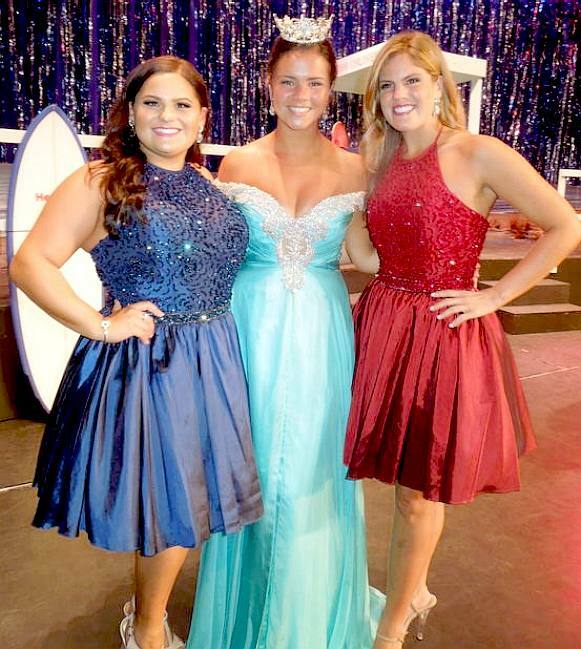 Former Miss Ocean City winners Carley DelSordo (2014), Kendall Coughlin (2015) and Devon Vanderslice (2013). Miss Ocean City hopefuls stand with Miss Ocean City Kendall Coughlin, front center. First row, from left, are Alexa Rosen, Julia Erickson, BriarRose Ginn, Amanda Meachon, Sadie Ford and Emily Batastini, first row; and second row, from left, are Abby Waid, Samantha Horowitz, McKayla Perry, Isabella Rose O’Brien, Shannon Wallace and MacKenzie Pearce. The Exchange Club of Ocean City has produced the Miss Ocean City Scholarship Pageant since 1979, awarding over $250,000 to young woman of our community to further their higher education. LITTLE MISS OCEAN CITY 2016 - [LEFT] Miss Ocean City Shannon Wallace and [RIGHT] Little Miss Ocean City Sarah Rodriguez. Just what makes Ocean City so great? First, there are the eight miles of sparkling ocean and bay beaches, all meticulously maintained. Next, there are two and half miles of boardwalk containing eight full blocks of family amusements (from 6th to 14th Sts.) like OC Waterpark, plus Gillian's Wonderland Pier. The Boardwalk is where you’ll also find the Music Pier, where concerts are performed throughout the year and is home to the Ocean City Pops. Adding to Ocean City’s family image is the fact that it’s a “dry” town, meaning there is no alcohol of any kind sold within its borders. Alcohol is available in nearby Strathmere. Ocean City is a city in Cape May County, New Jersey, United States. It is the county's largest city by area and is the principal city of the Ocean City Metropolitan Statistical Area which encompasses all of Cape May County. As of the 2010 United States Census, the city's population was 11,701, reflecting a decline of 3,677 (-23.9%) from the 15,378 counted in the 2000 Census, which had in turn declined by 134 (-0.9%) from the 15,512 counted in the 1990 Census. In summer months, with an influx of tourists and second homeowners, there are estimated to be 115,000 to 130,000 within the city's borders. 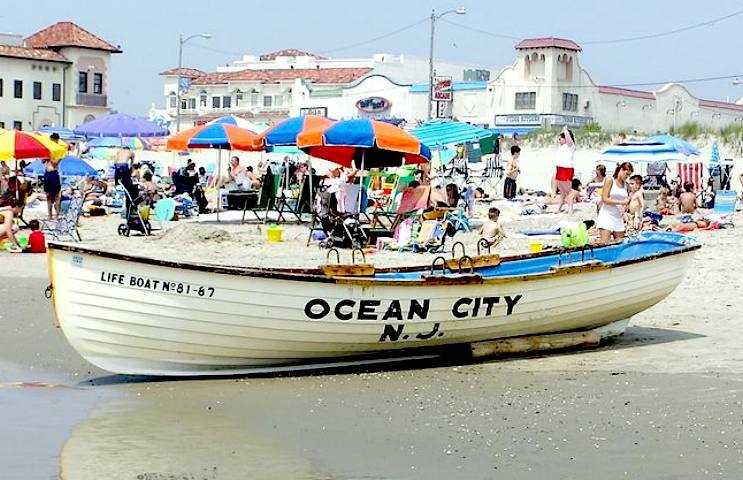 Ocean City originated as a borough by an Act of the New Jersey Legislature on May 3, 1884, from portions of Upper Township, based on results from a referendum on April 30, 1884, and was reincorporated as a borough on March 31, 1890. 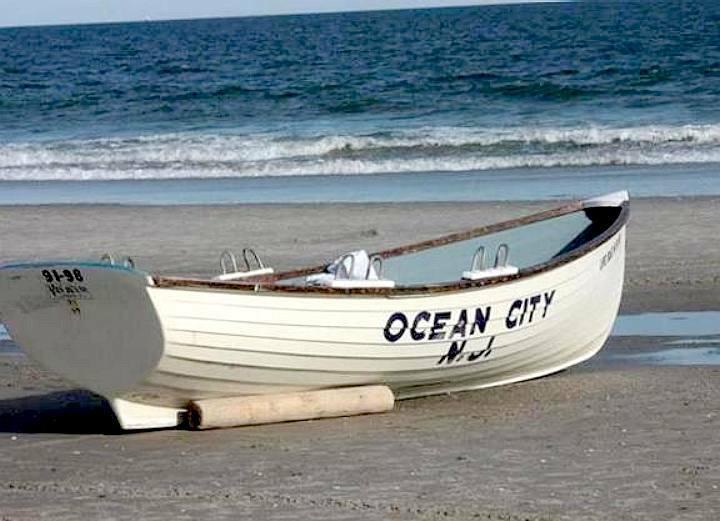 Ocean City was incorporated as a city, its current government form, on March 25, 1897. Known as a family-oriented seaside resort, Ocean City has prohibited the sale of alcoholic beverages within its limits since its founding in 1879, offering miles of guarded beaches, a boardwalk that stretches for 2.5 miles (4.0 km), and a downtown shopping and dining district. 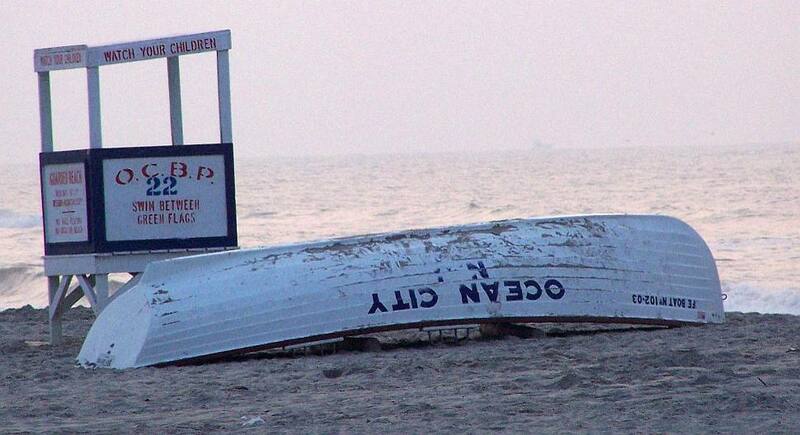 The Travel Channel rated Ocean City as the Best Family Beach of 2005. It was ranked the third best beach in New Jersey in the 2008 Top 10 Beaches Contest sponsored by the New Jersey Marine Sciences Consortium. In the 2009 Top 10 Beaches Contest, Ocean City ranked first. According to the United States Census Bureau, the city had a total area of 10.797 square miles (27.964 km2), including 6.333 square miles (16.402 km2) of land and 4.464 square miles (11.562 km2) of water (41.35%). Unincorporated communities, localities and place names located partially or completely within the city include Peck Beach. Ocean City is a barrier island with bridge connections to the Marmora section of Upper Township by the 34th Street (Roosevelt Boulevard) Bridge, Egg Harbor Township by the Ocean City-Longport Bridge, Somers Point by the 9th Street Bridge (Route 52), and the Strathmere section of Upper Township by the Corson's Inlet Bridge. The eastern side of Ocean City borders the Atlantic Ocean. 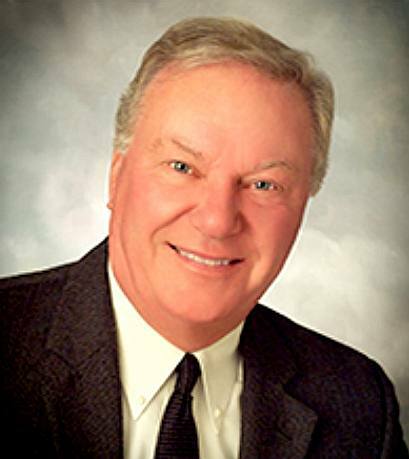 RICHARD W. (Rick) MEEHAN - The Mayor was elected to the City Council in 1985 and served as City Council President for 14 years up until he took over the office of the Mayor in June of 2006. Rick is a graduate of the University of Baltimore with a B.S. degree in Business Administration. Rick was born in New York City but grew up in Baltimore and spent his summers while in high school and college working at the beach. He moved to Ocean City for good in 1971. He is an active Realtor with Coldwell Banker Residential Brokerage. Rick is a member of the Governors Economic Development Committee, Downtown Association, Chamber of Commerce, and is the President of the Delmarva Irish American Club and the Co- Chairman of the Ocean City St. Patrick’s Day Parade. As Mayor he serves on the Pension Committee and the Police Commission. 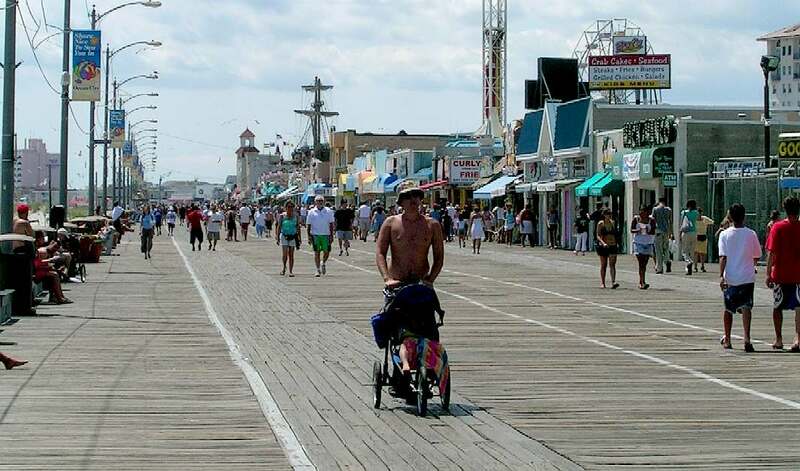 The Ocean City boardwalk is one of the most recognizable landmarks in the resort. It is also one of the most well-known boardwalks in the world. It is 2½ miles long and runs north from 23rd Street to St. James Place. The boardwalk is marked with mile markers for people who are exercising. The boardwalk was first built in 1880 from the Second Street wharf to Fourth Street and West Avenue. In 1885, plans to extend the boardwalk along the entire beach were made as the city's first amusement house, a pavilion on the beach at 11th street called "The Excursion" opened. A second amusement park, the "I.G. Adams pavilion", at Ninth Street and the boardwalk, opened soon after but was destroyed by fire in 1893. Following a second catastrophic fire in 1927, the boardwalk and its businesses were rebuilt 300 feet (91 m) closer to the ocean on concrete pilings, with parking created for cars in the space where the buildings and boardwalk once stood. The Ocean City Music Pier opened one year later. In 1965, the Wonderland Amusement Park opened on the boardwalk at 6th Street, which is still open to this day and known as "Gillian's Wonderland Pier". Only one major coaster operates there, which is the Runaway Train, a steel twister. Another amusement park, Playland's Castaway Cove, is also located on the boardwalk at 10th street. Two major roller coasters operate there, which are the Python, a looping coaster, and the Flitzer, a wild mouse coaster. A new major shuttle coaster at Castaway Cove, Storm, is expected to be finished in summer 2013. Two kiddie rides were removed from the park in early 2013 due to the construction of Storm. In 2007 controversy emerged about the city's proposed use of ipê, a type of wood, to re-deck parts of the boardwalk. Environmental activists protested against the city's use of the wood, but the plan went ahead. Today, there are bike and surrey rentals available along many boardwalk cross streets, but bikes and surreys can only be ridden on the boardwalk before noon during the summer. Attractions along the boardwalk include two family amusement parks with rides and games, an arcade, the Music Pier, a water park and various themed miniature golf courses. The Ocean City boardwalk has a wide variety of dining options, from sit-down restaurants to funnel cake. LIFE GUARDS - That is one famous lifeboat. The simple white and dark blue color scheme works well with the pale blue interior. It's amazing how a traditional wooden rowing boat can capture the attention of the public. This webpage is copyright © Cleaner Oceans Foundation (Company No: 4674774) July 2015, Solar Studios, BN271RF. The name Miss Ocean™ is a trade mark of the Cleaner Oceans Club™. The blue bird in flight logo is a trademark of BMS Ltd, used under Licence.